The Knights of Labor and the Tobacco Workers union. Founded in 1869, the Knights of Labor was the largest and one of the most important American labor organizations of the late 19th century. The Knights promoted the eight-hour day and supported efforts to end child and convict labor. After a rapid expansion in the mid-1880s — swelling to nearly 800,000 — the group quickly lost members after the Haymarket riot. The Knights of Labor had a mixed history of inclusiveness and exclusiveness, eventually accepting women and African-Americans as members and advocating the admission of blacks into local assemblies, but tolerating the segregated assemblies in the South and strongly supporting the Chinese Exclusion Act. 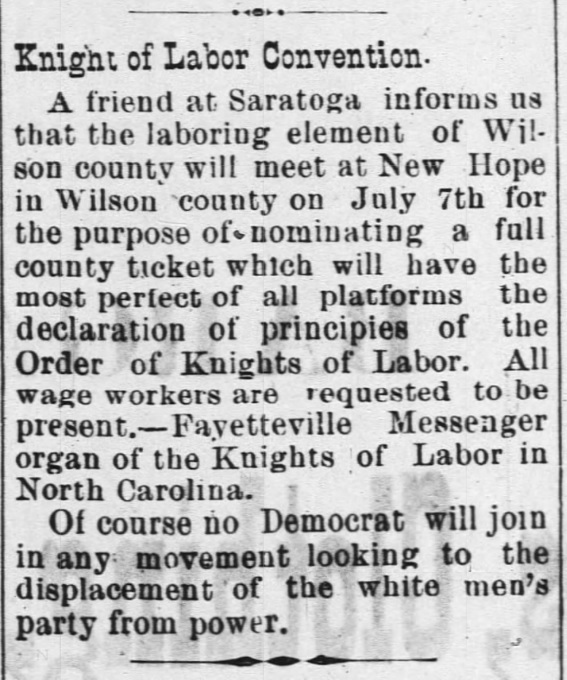 On the basis of local newspaper coverage, the Knights of Labor seem to have been most active in Wilson County about 1888. Though its strength was past peak elsewhere by that time, the organization boasted 100 locals in North Carolina, the most of any Southern state. Wilson Advance, 21 June 1888. Jane Bynum of Wilson was initiated into a Knights of Labor local in Wilson in the 1880s. Dues cards for Jane Bynum, a member of Wilson’s Knights of Labor lodge. Many decades later, tobacco factory workers ushered into Wilson County a new era of labor organizing. An early National Labor Relations Board decision, reported at 73 NLRB 207 (1947), offers a peek at the earliest days of this movement. Food, Tobacco, Agricultural & Allied Workers Union filed a petition to represent a unit of employees at a Liggett & Myers stemmery in Wilson. TWIU intervened, claiming to have beat FTA to the punch by securing voluntary recognition of its bargaining representative status a few weeks prior to FTA’s petition. The Board upheld the hearing officer’s rulings in the matter and dismissed FTA’s petition. On 19 August 1946, when three of the facility’s five departments were operating, Liggett and TWIU conducted an informal card check that revealed that TWIU represented a majority of 123 employees then employed at Wilson. The same day, they entered into a one-year contract. The next day, all five departments were up and operated by the same 123 employees. FTA asserted that on 16 August 1946 it had written a letter to Liggett claiming to represent a majority of its employees. There was no evidence that the letter was mailed, and Liggett denied receipt. On 21 August, FTA sent Liggett a letter that made no claims of representation and did not reference the August 19 letter. On August 29, FTA sent another letter demanding recognition and claiming majority representation, and the Union filed a petition on September 3, at which time the Employer had reached its peak 217 employees. TWIU claimed its contract barred FTA’s claim, and the Board agreed. 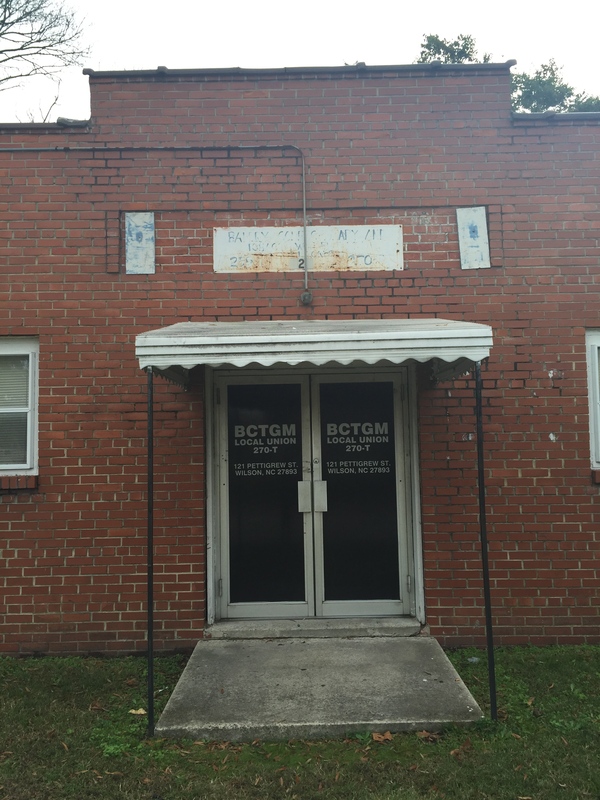 BCTGM Local 270-T, 121 South Pettigrew Street, Wilson. TWIU merged with Bakery & Confectionary Workers International Union in 1978 to form Bakery, Confectionary, Tobacco Workers & Grain Millers International Union. For the Union’s history in its own words, see here. For more on the Union’s involvement in early civil rights efforts in Wilson, see Charles W. McKinney’s Greater Freedoms: The Evolution of the Civil Rights Struggle in Wilson, North Carolina (2010). Copies of union cards courtesy of Deborah Moore Vles; photo by Lisa Y. Henderson, 2016.